At last something for myself. A set consisting of necklace and earring, bracelet only halfway done. I made this to wear during the coming Chinese New Year celebration, which starts tomorrow. 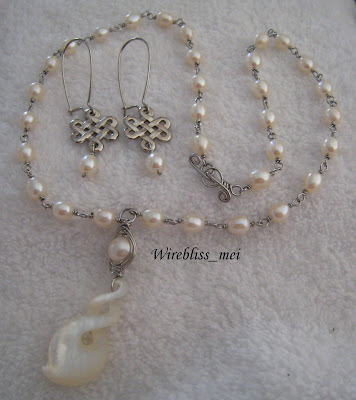 The pendant (excluding the herringbone weave pearl) is from New Zealand. My aunt who live in Christchurch gave it to me few months back. The toggle clasp is my first and i like it. Will make them for my future projects. The mystical knot earring is from Kuala Lumpur when i was there for a meeting two weeks ago. I added the pearls at the bottom....for personal touch and to match the necklace and bracelet. Happy Prosperous Chinese New Year 2007 everyone.